Fourth biennial holiday shopping survey indicates 95% of consumers say how well retailers handle returns influences their decision to order from them again. Hamilton, NJ, December 18, 2018 – Voxware, a leading provider of cloud-based voice and analytic supply chain solutions, today announced additional results from its fourth biennial holiday shopping survey. 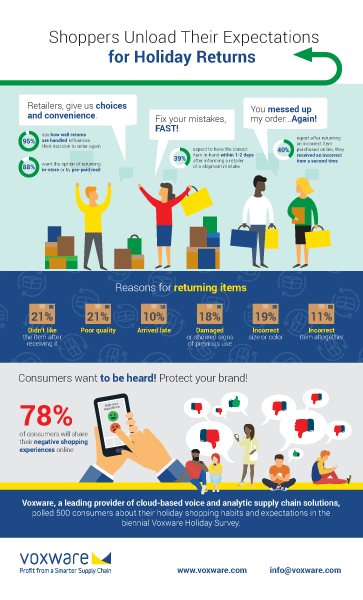 Today’s statistics highlight why consumers return items purchased online and how their experiences with the returns process affects their decision to make future purchases with retailers. The preferences noted above by consumers point to the demand for omnichannel returns capabilities and the need for retailers to be able to manage inventory levels and track items across in-store and online channels. Prior to the kickoff of the 2018 holiday shopping season, Voxware released survey data about shopping and shipping habits. 31% of consumers reported they would abandon shopping with a retailer altogether if they received a single incorrect item from that retailer. Those who don’t abandon shopping with that retailer want the error fixed immediately. The survey found that 39% expect to have the correct item in-hand within 1-2 days of informing a retailer of their mistake. Sadly, the returns process remains flawed, as 40% of respondents reported receiving an incorrect item after returning the first incorrect item. For those retailers struggling with their returns processes, there is hope. Many retailers rely on Voxware VMS to improve speed, accuracy and efficiency across all functions in the distribution center. Using Voxware VMS, warehouse operations realize immediate improvements in accuracy, double-digit productivity gains, reduced labor and operating expenses and complete visibility into the entire distribution operation. By supporting multimodal technologies across all workflows, Voxware allows its clients to choose the right solution at the right time, whether that be voice, scanning or vision through its Augmented Reality solution. Delivering the right product, and on-time is critical, and even more so during the holiday season when consumer expectation is at an annual high. For those brands willing to take a risk, let it be known that the survey found if delivery is late or the wrong item is received, more than 78% of consumers will share their negative experiences online about that product or retailer. More than five hundred consumers were surveyed about their holiday shopping plans, their shipping expectations and the impact that late or incorrect deliveries have on their future shopping decisions. Voxware offers technology solutions that deliver essential supply chain information exactly when and where it’s needed, optimizing the speed, accuracy and efficiency of distribution operations. Its product suite includes both warehouse automation and analytics solutions uniquely focused on distribution functions. With these solutions, companies reach an unprecedented understanding of how best to manage their operations, improving profitability by reducing costs and exceeding customer expectations. For more information, please visit www.voxware.com.